To a fisheries biologist, spring means it’s time for largemouth bass electrofishing. Electrofishing is a blast. Launch the boat, extend the electrodes, adjust, kick on the generator, set voltage and amperage, man a dipnet and step on the safety switch. Lean over the front rail and watch. 240 volts adjusted to 6 or 8 amps, and fish begin to appear, almost like magic. The scapper (the one who picks up the fish) goes to work, the net pierces calm water and the first fish is brought on board quickly, and gently deposited into the aerated live well. As the boat moves across the water, mostly along the shoreline, different sizes of different fish are collected and put into the live well for processing, soon. It’s never hard to find help to go electrofishing! I know, I know, it’s November. In the North Country, pondmeisters likely are faced with a layer of ice right now. If not, you soon will be. In the south, we face the beginning of winter. Holidays are on our minds, but in another month or so, we will all be looking forward to warmer seasons. So, let’s sit back and think of spring. To a fisheries biologist, spring means it’s time for largemouth bass electrofishing. We know there is a lot of curiosity out there when it comes to this standard fisheries sampling gear. So, let us show you how largemouth bass abundance in a series of South Dakota ponds was related to the numbers and sizes of largemouth bass caught by electrofishing. Along the way, we’ll give an explanation on how electrofishing works. In the South Dakota study, 14 ponds had both abundance estimates (number of fish per acre) and electrofishing catch per hour. Ponds had surface areas that ranged in size from 0.8 acres to near 20 acres. 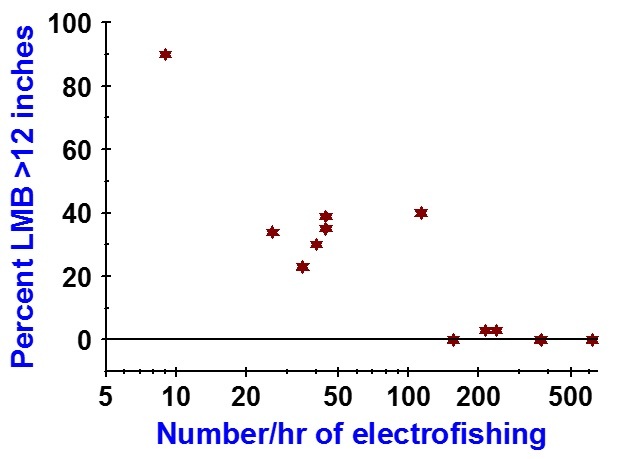 As abundance of largemouth bass increased, so did the number we caught per hour of night electrofishing (Figure 1). While that probably is not a big surprise, you can see there is quite a bit of variation in catch rate at a given density. Look at about 45 bass/acre – you can see we caught about 10/hr in one pond but about 70/hr in another pond. That could have been due to temperature, weather, amount of structure in the pond, or even water quality characteristics. Heck, maybe we had an inexperienced worker on the front of the boat who was not very good at dipping the bass. If water is too soft (low conductivity, low alkalinity, etc.) then our electrofishing equipment is not as effective. Similarly, when water gets too hard (high conductivity, high alkalinity, etc. ), then we again are not as effective. Figure 1. As the abundance of largemouth bass increased in 14 South Dakota ponds, so did the number of 8-inch and longer bass caught per hour of night electrofishing. Electrofishing is one tool in our pond management tool kit. Those who haven’t been around electrofishing episodes don’t often know what to expect. Some folks think the boat is launched, the foot switch is engaged, and all the fish in the pond pop to the top and make their way to the boat. Kind of like a Pied Piper of fishing. It’s not like that at all. Our mission when electrofishing is to collect a random sample of fish which is statistically reliable and significant for that population. Catch rate is important to us, but maybe not quite as important as collecting enough fish to evaluate a given population at that time. Now, switch focus to Figure 2. Look what happens to proportions of larger bass in the population sample as bass abundance increases. At low density, bass have less competition for available food, and tend to grow faster and larger. As abundance increases, growth and size structure declines. Biologists call this “density-dependent growth.” Once we got to about 150/hr of largemouth bass, very few bass ever exceeded 12 inches. These high-density populations represent the classic crowded or stunted bass populations. 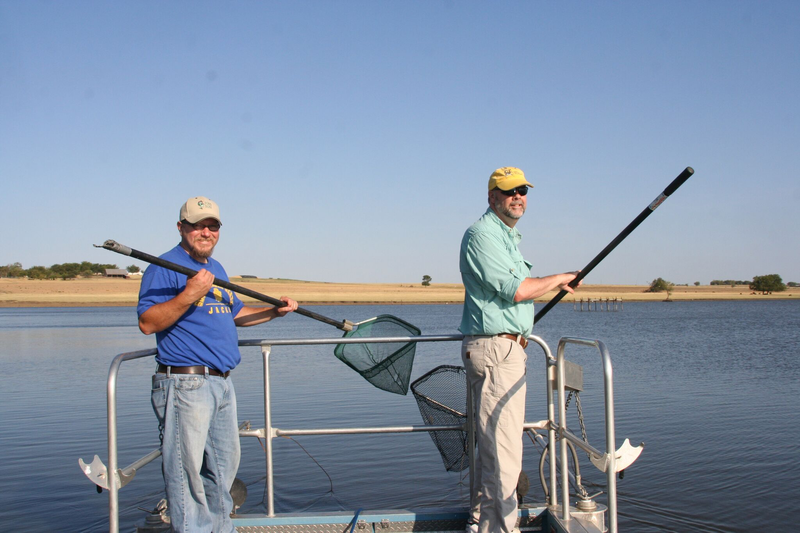 Dr. Jeff Slipke, a biologist with Midwest Lake Management, told us that 90% of the clients they visit for the first time have overly-abundant largemouth bass. Ninety percent! Treatment? Selective harvest. Numbers of smaller bass must be removed, either by angling or by a professional biologist using an electrofishing boat. The goal is to reduce bass density, increase their growth rates, and grow larger bass! Figure 2. As the abundance of largemouth bass increased in a series of South Dakota ponds, the percent of largemouth bass that exceeded 12 inches declined. As we electrofish, the boats moves around the pond or lake, and we get to see a snapshot of what’s going on underwater. These graphs define bass populations easily enough, but as electrofishing continues, we typically see a corresponding dip in quantities and sizes of forage fish. Too many bass are feeding on too few bluegill or other forage fish. As you can imagine, seeing small forage fish in an overcrowded bass pond is like seeing a golfer in a lightning storm. Neither one lasts very long. 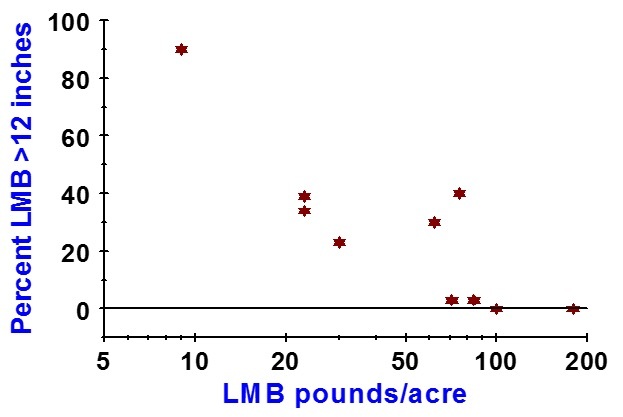 What happens to the size structure of largemouth bass as the bass biomass (pounds/acre) increases? 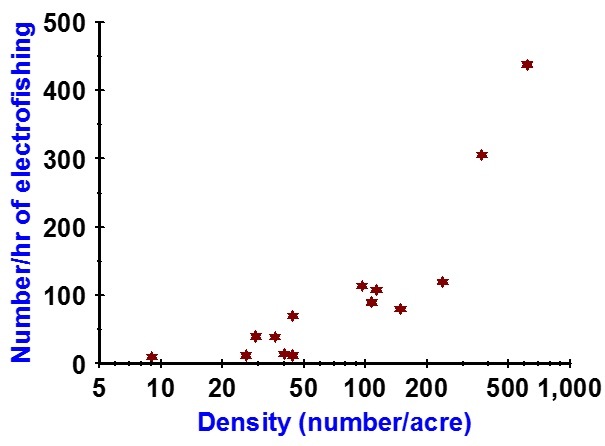 While we only had biomass estimates for 10 ponds, you can see the same trend as for bass abundance (Figure 3). Once largemouth bass got to 100 pounds/acre, NONE of the fish we collected by night electrofishing were over 12 inches in length. Any pond can only support so many pounds of largemouth bass. Do you want those pounds as fewer, larger bass, or as big numbers of smaller bass? Figure 3. As largemouth bass biomass (pounds per acre) increases in a pond, there is more competition for available food. As a result, largemouth bass growth slows and fewer fish reach large sizes. The ponds on the lower right hand corner of this figure are often said to contain stunted largemouth bass. Electrofishing allows biologists to paint a picture of population structures under water at a single point in time. This information is important for serious pond managers. Electrofishing, done at the right time, not only tells us the status of your fish population, but allows biologists to compare year to year, and project what will happen in months to come. Electrofishing can help you decide whether or not to feed, or to adjust the habitat for different species or size ranges of fish. Here are other pertinent points about electrofishing—different ponds respond differently to electrofishing. The limits of an electrofishing boat not only include water chemistry and conductivity, but also depths of the water. Most electrofishing boats work best in water less than six or seven feet deep. When fish are deep, electrofishing may not do the trick. That’s why we work in spring and fall months when fish tend to be nearer the shoreline. After all, we do want to get a sample of fish which tells the underwater tale of your pond’s population. While this process is fun we need to add some qualifier comments. Seriously, electrofishing is dangerous, and safety must be foremost in the mind of any operator. We always ensure all boat occupants wear life jackets, rubber gloves, and rubber boots. We don’t want anyone to be part of an electrical circuit. Earlier in the article, we mentioned the safety switch. 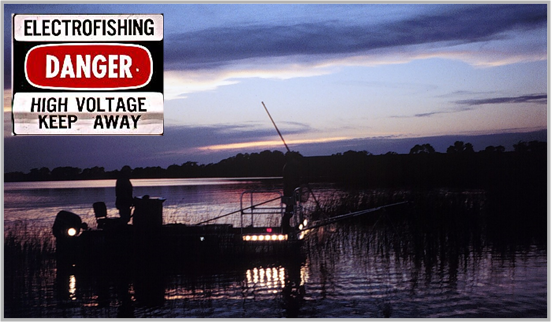 There typically are two safety switches on electrofishing boats. One is the power switch on the control unit operated by the boat driver. The dipper up front also has to step-on a switch to allow electricity to flow into the water. If that person falls forward into the water, the switch would disconnect, and there would be no electrical field in the water. 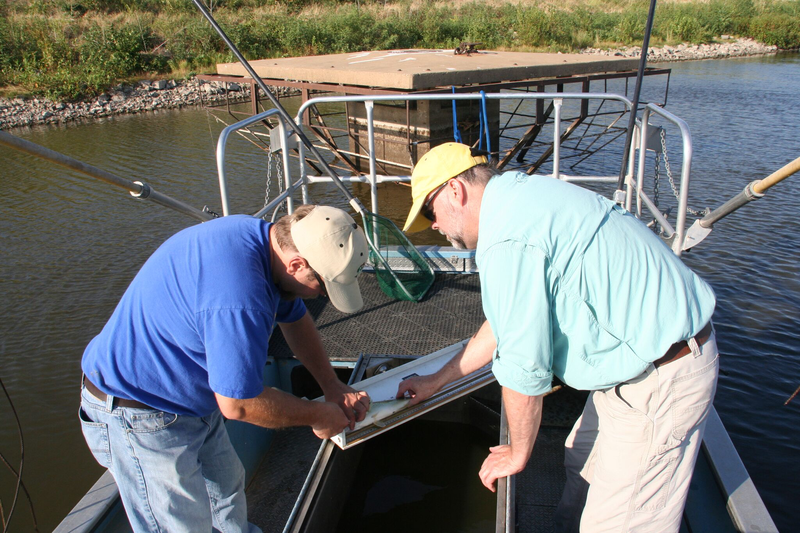 The specific information discussed here involved relationships between bass abundance and electrofishing catches for our South Dakota sampling. Such relations also occur elsewhere across the country. The scale may change (that is, the numbers may be higher or lower) depending on geographic location and type of electrofishing equipment, but the relationships remain the same. Night electrofishing is one of the more fun duties of a fisheries biologist. This entry was posted on Wednesday, November 14th, 2018 at 3:32 pm	and is filed under News & Updates. You can follow any responses to this entry through the RSS 2.0 feed. Responses are currently closed, but you can trackback from your own site.